Our Screw Thread Insert (STI) Taps are used specifically to create threads for Helical Thread Inserts. STI Taps are oversized so the thread produced will accept a Helical Wire Insert of the same nominal size and pitch - meaning the hole created by the Tap goes back to the original dimension allowing the original fastener to be used. A "Bottoming" style Tap has a continuous edge with almost no taper which enables it to cut threads to the bottom of a blind hole. The Tap can be used and the Helical Insert can be installed in most materials including aluminum, magnesium, cast iron, carbon steel, stainless steel, and plastic. Proudly made in the USA. 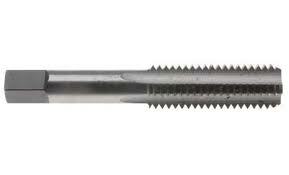 Tap also available in the following styles: Plug, Spiral Point, Spiral Flute & Spiral Flute Bottoming. Please call for quote and availability. Looking for the Inserts or a Complete Thread Repair Kit?